Save 44% On The Top 4 San Francisco Attractions Plus Unlimited Cable Car Rides! 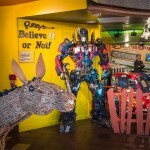 $2 Off Adults & $1 Off Children Admission to Ripley’s Believe It of Not! Odditorium Museum OR $1 Off Combo Ticket of Mirror Maze and Museum. Cannot be combined with other offers. Must be used at time of purchase.